Can you actually sweat out a sickness? Growing up playing sports, especially a sport like wrestling that is just known for having a bunch of bacteria and disease associated with it, I’ve heard the saying oh just sweat it out quite a lot. I never really understood this though because when I was sick during the season when I was playing sports I usually did not feel good, or feel like I had the energy to even walk around my house let alone go and workout or practice. So I always wondered if it were possible to actually sweat out a cold or a sickness that you had incurred. 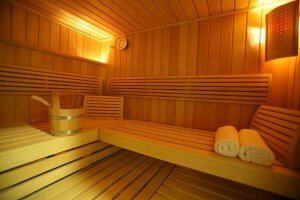 Saunas are recommended to many patients with asthma and arthritis and things of this sort. Scientists do have some evidence that shows that saunas do benefit in recovery from colds and also reducing the amount of sickness a person contracts. At temperatures of upwards of 180+ degrees fahrenheit saunas are definitely a pl ace where a lot of sweating and exfoliation takes place. Now some scientists believe that the saunas show these benefits because when you’re in the sauna you’re sweating and all your pores are open and exfoliating and other think it is due to the fact that the high temperatures in the sauna weaken the viruses. In a study, Austrian researchers set up 2 groups of 50 adults, on group was to sure the saunas regularly and the other was to not use them. The researchers tracked the 100 subjects for 6 months. After the conclusion of the 6 months, the scientist research showed that the subject who used the sauna regularly contracted less colds as opposed to the group who did not use the sauna. Overall, I think that saunas have definitely showed positive results and are leading scientists to say that using the saunas are good in fighting colds, but I don’t think there is enough proof to say that they definitely do. In my opinion I feel like all peoples bodies are different and they may react to the sauna in different ways, so I feel as if the sauna could benefit one person in this scenario and not the other just due to the fact at how their body reacts to this. I also do not think that this will make me want to go sit in a sauna when I am sick seeing as this does not seem to have that many benefits, it’s more so saying there are benefits to not getting colds, not necessarily if you have a cold and are trying to get rid of it. This entry was posted in Uncategorized on December 2, 2016 by Benjamin R Tuohey. I never imagined saunas to be a good solution for colds. As a non sporty person i have heard the phrase “just sweat it out”. I really liked your topic it was original and your blog was done very well. You talked about the studies in a concise and understandable manner. I can agree with you on the notion that everyone’s body is differently. This source linked below may help find out more. I could totally see this theory being true especially for fevers. When I had a fever a month or two back, I ended up going out to a frat and sweating it out and eventually felt great hahah. This article talks about how sweating out a fever is just the body’s reaction to releasing excess heat from your body therefore reducing the fever which is a good thing! In the case of a fever or a similar illness, I feel like “sweating out” the illness can be incredibly beneficial – the reason why we get fevers in the first place is to help out bodies sweat. That being said, for many other illness I don’t think it’s a worthwhile endeavor to go to a sauna. Especially in the case of illness, you can put yourself at serious risk for passing out. Not to mention the possibility for saunas themselves to be a hot bed of disease. I’ve included a link below corroborating the idea that saunas may not be great for one’s health. I always heard the phrase “sweat it out” playing sports as well. Whether it was the placebo effect or not i’ve seen it work on myself. I think that there is more of the story to be told though. At my school’s wrestling practice it was always mandatory that you wipe yourself off after practice and immediately go home and shower for fear of infections like ringworm. The New York state department of health gives its recommendations below for preventing more than colds when thinking of physical activity and contact sports.